For this weeks ‘Food Talk with Mackenzie’ (F.T.W.M) I am going to give my honest opinions on everyones favourite place Cafe Thai! A great place to go to, to treat yourself this weekend! Cafe Thai is situated in West Vale, on the main road opposite Vine, Tesco and Cinnamon. There is limited parking, however easy to get to via bus or taxi when coming from either Halifax or Huddersfield. You can also pop to the Vine for before or after dinner drinks (or both) as their cocktails are great too. West Vale is a great place to go to for food and drinks with family, friends or for a date, as there is something for everyone. Cafe Thai has some great options for everyone. If you love Thai food, stir fries, and curries, you are sure to love this place. Their mains and starters are great, and they even have specials on, which I love! My favourite starter is off their specials menu and it is number S2. When at Cafe Thai you order with the number and not the name of the dish, as it makes it easier for you and the server. S2 is called Kanom Jeeb and is steamed dumplings with minced pork, chicken, prawn and onions, topped with garlic and served with a black bean sauce for dipping. Delicious! Another great starter is their mixed started, which can be order for one or two people and allows you to try a little bit of everything. You are given a chicken satay, a deep fried spring roll, which is filled with minced chicken, noodles and vegetables. You also get minced chicken and prawns wrapped in wanton pastry and deep friend, as well as prawn and chicken toast and a deep fried corn cake, all served with various dips. It is as great as it sounds! Now on to the best bit, main course! I always struggle to decide what I want as everything sounds so good! But here are a few great dishes me and my family have tried. Number 36, Sua Rong Hai (Tiger’s tear), has to be my favourite. It is a Thai style marinated sirloin steak with Thai chilli sauce, which I get with a side of rice or noodles. It’s great cooked medium-rare and melts in the mouth. Its packed full of flavour and you will deffo love it as much as I do. The most popular Thai dish is probably a Pad Thai, which is number 44 on their menu. It is a great Pad Thai, packed full of amazing flavours. Including eggs, bean sprouts, spring onions and topped with ground peanuts. You will love it! If you are wanting something a little different and love fish, then go and try number 40, Pla Rad Khing, which is deep fried Sea Bass with carrots, baby corn and peppers with a ginger, mushroom and spring onion sauce. It is super tasty and great with a side of their sticky rice. Or if you aren’t a fish person, try one of their stir fries which comes with a choice of chicken, pork, beef, or tofu. My favourite is number 31 which comes with mushroom, peppers, onion and carrots in an oyster sauce. Cafe Thai is also available to takeaway or they have a another restaurant upstairs, which serves Thai food but tapas style. Somewhere I am yet to go, but once I do, I will be sure to do a review. They have also just opened a sister restaurant down the road, called Cafe Italia and I shall be making a visit there soon. Keep a watch out for all these upcoming reviews! 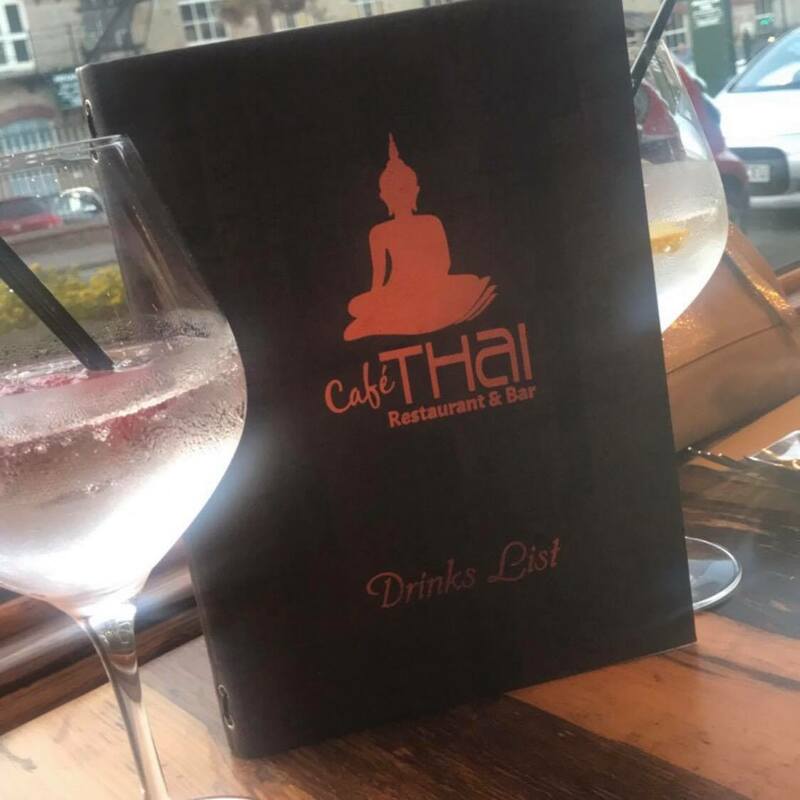 Hope you enjoyed my review and let me know your opinions of Cafe Thai in the comments!